Natural Sciences is part of a selection of study areas that make up the Life Skills Learning Programme. Science is a systematic way of doing investigations through applying scientific knowledge to find explanations for phenomena. It is the understanding of how things work in the world around us and also support the learners to understand their responsibility towards themselves, others and the environment. It has a direct link with the knowledge and skills taught in various vocational subjects. One week per term is allocated to recycling and all the Grade 4 and 5 learners acitivily participate in the programme. Motivational pins are awarded to learners who regularly contribute to the programme. It may be pinned on their school caps or uniform. This reward system is showing positive results: Encouraging whole school learner participation and awakening an awareness towards daily recycling. 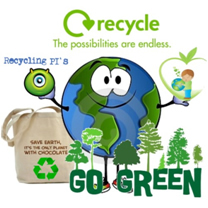 Recyclable goods are sent to school daily. It is evident that our Gateway learners and their parents are devoted Recyclers.